More Qualifications. More Opportunities. That is the power of the CCS. The Certified Copywriting Specialist (CCS) designation is a self-study, online copywriting training and certification program. The CCS program is a global, trusted certification program built exclusively by and for copywriting professionals. The CCS was created as a continuing education and professional self-improvement program. 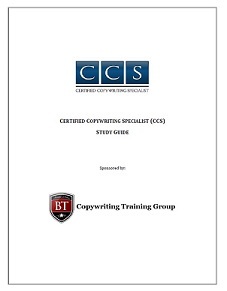 The CCS is backed by the Copywriting Training Group (CTG), a 12,600+ member association of copywriting professionals. Every year, membership grows and registration for the CCS certification increases.
. 1) Add the Certified Copywriting Specialist (CCS) to the education section on your resume, showing tangible evidence of your dedication and education in the copywriting industry, helping set you apart from others with your same level of more generic education.
. 2) Speed up your success within the copywriting industry by listening to recorded audio interviews with experienced copywriters.
. 3) Quickly gain specialized knowledge, learn the common models and words used in copywriting, and gain confidence in what you know and don’t know.
. 4) Scientific studies have shown that earning a certification can increase your earning power permanently.
. 5) Complete our program for just $999 at your own pace over a few months, or a few years. Once you pass the online timed examination, we will mail you a certificate in a leather-like diploma holder to display in your office or home. 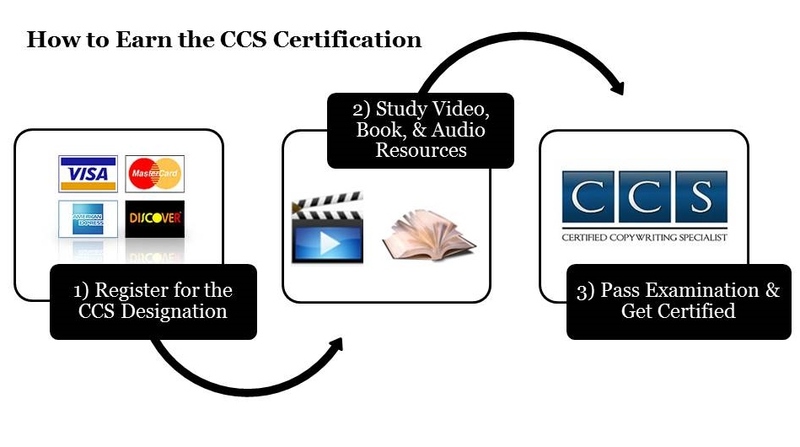 To earn the CCS designation, you must complete the the CCS program. To learn more about that process, please see our How it Works page. If you have questions you can reach us in our Key Biscayne, FL office at (305) 503-9050. To get started today, register here.